The Exorcist series has had a strange, and some say cursed, history. The movies have gone from the best to the worst of what cinema has to offer, and has been a constant source of controversy. In the early 2000’s, a fourth film was made–and then re-made. These back-to-back films were prequels, telling of the early days of Father Merrin, who was played by Max Von Sydow in the first two movies of the series (even though the character died in the first). 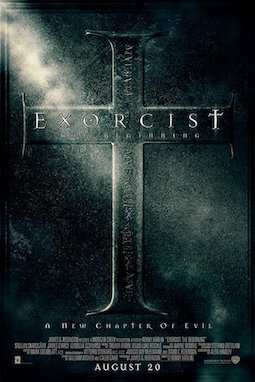 The version of the prequel that the studio didn’t want to release was released anyway as Dominion: Prequel to the Exorcist, which tells an alternate story to the movie that was released theatrically, Exorcist: The Beginning. This is perhaps the first time in history that a remake has been released before the original. 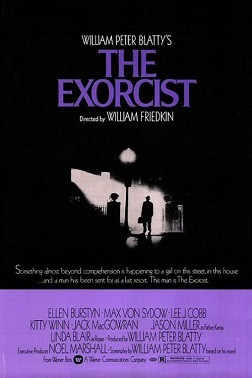 The Exorcist, released in 1973, is still considered one of the scariest movies ever made. It tells the story of a young girl (Linda Blair) who is possessed by a demon, much to the distress of her actress mother (Ellen Burstyn). Two priests, young Father Karras (Jason Miller) and old Father Merrin confront the demon and finally expel it from the body of the girl. This movie was a monster hit at the box office, bested only by Jaws two years later. As with any successful film, people look to try to cash in on its popularity by producing sequels. 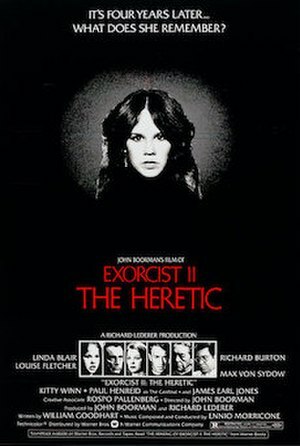 The initial follow-up was the completely nonsensical and non-scary Exorcist II: The Heretic that featured a wooden Richard Burton, James Earl Jones in a locust costume, and the demon Pazuzu. It brought back Linda Blair as Regan, now a teenager whose mom is off filming a movie, so she’s left in the care of some guardian and a psychologist (Louise Fletcher) who has invented a machine that links people’s brains via flashing light. Richard Burton is a priest who is sent to investigate Father Merrin’s death (four years after the fact) and traces the ancient demon to Africa to track down James Earl Jones among plagues of locusts. There were also flashbacks featuring a returning Max Von Sydow with no dialogue as a younger Father Merrin in Africa. Why Von Sydow agreed to this cameo is a huge question. The film was a critical failure, even with director John Boorman pulling it out of the theater to re-edit it (after audience members at the première threw things at the screen), and is now considered one of the worst horror sequels ever made and was a recipient of the Golden Turkey Award. It took thirteen years for another sequel to be made, which is amazing considering all the quickie direct-to-video horror sequels churned out. 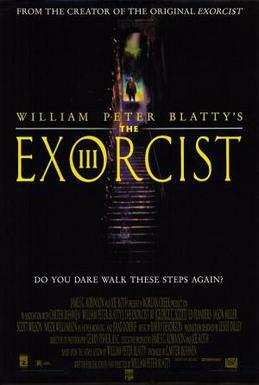 The original novel’s author, William Peter Blatty, who wrote the screenplay for The Exorcist, adapted his novel Legion and directed the film, now dubbed Exorcist III. George C. Scott took over for the late Lee J. Cobb as Lt. Kinderman, the detective who helped investigate the supernatural goings-on in the first film. Ignoring the events in Exorcist II, this story had Kinderman reuniting with Jason Miller’s Father Karras, now known simply as “Patient X” and is possessed by the evil spirit of the Gemini Killer (Brad Dourif). Critical reaction was mixed and this film actually made less money than The Heretic. It’s no surprise that it took fourteen more years for another film in the series to be made. This time, it was decided to do a prequel, focusing on Father Merrin’s younger days at an archeological dig in Africa. Initially, John Frankenheimer was hired to direct Exorcist: Dominion starring Liam Neeson from a script by William Wisher and Caleb Carr, but had to step down due to health reasons. He died a month later. He was replaced with Paul Schrader, who has a long string of highly praised films that he either wrote or directed. Neeson left the project and was replaced by Swedish actor Stellan Skarsgård, which is appropriate since Skarsgård was portraying a character originated by fellow Swede Max Von Sydow (though the character is Dutch). Schrader filmed his movie to a tune of approximately $30,000,000. However, Morgan Creek, the production company paying for it, didn’t think it was scary. Reminiscent of the pilot of Star Trek, they found it too cerebral. They fired Schrader and most of the cast (keeping lead Skarsgård). Alexi Hawley was brought in to rewrite the screenplay to add more “jump scares” and then Renny Harlin was hired to direct this new version, now known as Exorcist: The Beginning. Now they had two versions of the same story with a total cost of $80 million. Unfortunately, the release only made $78 million worldwide and was universally panned. Morgan creek then dusted off Schrader’s film and submitted it to some film festivals, as well as releasing it on DVD to try to recoup some of its budget. Was Morgan Creek right in scrapping Schrader’s movie and remaking it before even giving it a chance? Financially, it didn’t seem to make a difference. But what about creatively? The film begins near the end of WWII as the Nazis are pulling out of Holland. However, a soldier is murdered in one small town, so the Germans round up all the townspeople for retribution and force Father Merrin to choose who is to die. This horrific scene scars the priest and shakes his faith. A few years later, he is in East Africa overseeing an archeological dig that reveals a church that has apparently been intentionally buried. There’s good reason for it, as it’s apparently a shrine to the war of angels against demons that sits over a Byzantine-era demonic alter. The name Pazuzu is never used, but the imagery is similar to real historical idols. After this is discovered, strange events happen. Hyenas comes out of the wilderness, only to be eaten by cows. A baby is born covered in maggots. British soldiers guarding the church decide to pilfer some precious stones and end up gruesomely sacrificed, setting off a standoff between the Brits and the local tribe of Africans. A deformed teenager, Cheche (Billy Crawford) is hospitalized and soon shows signs of being possessed. Father Merrin’s lack of faith is contrasted by a young idealistic priest, Father Francis (Gabriel Mann); and his vows are tested with a growing relationship with a female doctor (Clara Bellar), who is a concentration camp survivor. He also find himself in the middle of a replay of the opening scene, this time with the British Army standing in for the Nazis. Ultimately, Merrin needs to overcome his frailties to confront the demon and save Cheche’s life and soul. Skarsgård’s performance is terrific, and it’s understandable why Morgan Creek wanted to keep him as the lead. His internal conflicts inform all his actions. Mann’s Father Francis is also effective and very likeable. Others in the cast are decent, and Crawford is good as both the innocent Cheche as well as the demon possessing him. The weak link in the cast is Bellar’s Rachel. She is simply terrible, speaking lines in a halting monotone no matter what the situation. The cinematography by Vittorio Storaro is beautiful, nicely capturing the Italian and Moroccan locations (much better than the cheesy sets pretending to be Africa in Exorcist II). The art direction is effective, even if the interior church and demon cave look a bit too much like it was built on a sound stage. The costumes were perfectly evocative of the ’40’s with the African culture depicted realistically. The CGI effects were not initially completed, but Schrader was given money to complete it for the eventual release; however, they were still hurried. Much like the Donner Cut of Superman II or the DVD extended cut of Alien 3, you have to forgive the film for this flaw. If we know going in that the effects are last-minute fill-ins just to be able to tell the story, like temp tracks in a rough cut, then we can overlook the obvious and pretty lousy effects. Just to be clear, this movie is not a horror film, despite its cinematic heritage. It is an introspective drama about faith and how mankind can give in to evil. The supernatural elements, while often gory, mostly reflect upon humanity both good and bad. Those expecting a terrifying motion picture like the original will be disappointed, which may explain the less-than-favorable reviews. It’s goal is to be a character-oriented contemplation of good vs. evil with supernatural elements made for adults. It doesn’t pander to the audience and aim for teenage viewers like most films of this ilk. The biggest problem with the film (besides Bellar’s performance) is the ending. It’s difficult to have a showdown between a human and an otherworldly entity. You either get a standoff where one person stoically holds a cross and yells religious commands while the other writhes around with ghastly makeup (like in the original), or show the powers of the demon by over-the-top destruction (like in Exorcist II). This film chose the former with some weird light show effects in the sky. There was also tension as various characters were affected by the demon in various ways, some of which ended in death. It probably worked better on paper than it did on film. Mostly, this felt like an important motion picture, and it’s too bad that the studio wasn’t behind it from the beginning. The execs were obviously looking at cashing in on the name and reputation of the original rather than trying to create a film that stands alone and works according to its own rules. It’s not as good as the 1973 classic, but that’s a hard standard to match. Taken on its own merits, Dominion: Prequel to the Exorcist is an intelligent, intriguing film. Out of all of the follow-ups, I really appreciate William Peter Blatty’s ‘Exorcist III’, the adaptation of his Legion novel (the only literary sequel to his The Exorcist bestseller). He brought a good many aspects from his story and there’s a lot to like about it, at least for me. The studio insisted on some of its hokier aspects (there had to an exorcism in there while there wasn’t in his sequel novel). I really despise ‘The Heretic’ sequel and remain totally indifferent to Harlin’s prequel. Schrader’s version is intriguing for the reasons you cover, though. It’s really too bad they didn’t come up with a completely different story when they decided to reshoot Dominion considering it was a completed film they were scrapping. If they had any fore-thought, they would have had a completely different episode in Father Merrin’s life. That way, if the movie had been a success, they could have released the Schrader film shortly afterward as a companion piece and another film in the series. It really says a lot about the “suits” when they can’t see the quality of filmmaking put into that film and think that a hack like Renny Harlin could improve upon it. All they were looking at was marketability–Harlin could create “boo” moments and schlocky scenes but not create a film that has higher aspirations.